Weber Genesis Platinum B Gas Grill. Weber-Stephen Products Co. This grill has been replaced by the Genesis E-320 or see my list of the best Gas Grills between $500 and $1,000. All around this is one of the best gas grills on the market for its price. Take care of it and a Weber Gas Grill will last you for a decade and give you the versatility you want to grill most anything you can think of. The high-quality parts, particularly the stainless steel burners will need an occasional cleaning, but will last you long enough to pass it on to your kids. People who own Weber grills swear by them and always buy Weber. This unit is also large enough to suit almost any need. Weber builds grills that are among the most recommended in the world. Their wide availability makes them very popular as does their consistently high quality of manufacturing. This Weber grill is an attractive unit of stainless steel and painted black. The lid is a heavy dual layer stainless steel piece, the body is black painted cast aluminum and the frame is welded steel. Welded steel is much better than the riveted or bolt frames on many lower quality grills. Apart from the looks, the Weber burner system provides good heat distribution that eliminates hot and cold spots. The three burner configuration gives you the ability to grill indirectly or to have a hot sear zone while having a cooler grilling area. Control on this grill is very good because of its highly adjustable valves. The Genesis C offers 36,000 BTUs from its three burners under a primary cooking area of 424 square inches. 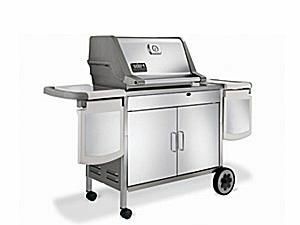 While this is a little low for a grill of this size the efficient design generates more heat with less fuel than many other grills. If you want to sear a steak you'll probably have to use all three burners on high after preheating for about 10 minutes. This unit also comes with a 12,000 BTU side burner. While you pay for the Weber name, they are the only company that will give you 24/7 support 364 days a year. They also have a great reputation for service. This grill is also available in natural gas.